INKING FLY LINES are confusing. This is such a source of interest (and in some cases angst) that this was the section of last week’s Ten Tips I heard the most about. Since sinking lines are a broad topic all to themselves, I wanted to drill down this week on sinking lines alone. As we went over in the last Ten Tips, the first thing you need to understand to grasp the concept of how sinking fly lines work is that density is not the same thing as mass. Density determines how fast a fly line sinks in water. Mass determines how much the same fly line weighs, and those two things are not equivalent. Just as a multi-ton metal battleship can float despite weighing as much as a parking garage, there are lots of very heavy fly lines that also float like corks. They achieve this miracle the same way the battleship does: they are packed full of air. Specifically, floating fly lines are made of liquefied polyvinylchloride (PVC) (or in some cases other plastics), which is extruded through a computer-controlled opening called a “variable orifice dye” with a thin strand of braided Dacron running straight through the middle of it. In other words, fly lines are made a lot like can dles, only with PVC cooling around the “wick” (a fly line core) instead of wax. soft plastic in water, roughly an inch or so a second. To make the line sink faster, manufacturers begin sprinkling in increasing amounts of that heavy metal dust (which could be lead, tungsten or things like bismuth, depending on the sink rate the manufacturer is trying to achieve). As more or heavier dust is sprinkled in instead of those hollow microspheres, the manufacturer adds density and thus the line sinks faster. The rate at which a fly line sinks is usually explained in a “Type” system, running from Type I all the way to Type VI. The heaviest-sinking lines on the market will sink at about 14-16 inches per second, which right now seems to be the upper limit with existing technology. The original AFTMA grain-weight chart established in the 1960s still serves as a set of rough guidelines for designating line sizes. The standard weight indicates the weight in grains of the first 30 feet of line for each line class. With me so far? It’s important to understand that line weight has nothing to do with how fast the fly line sinks. Instead, line weight is a description of how physically heavy a fly line is rather than how dense it is; classically this measurement was taken using only the front thirty feet of fly line, and was measured in “grains,” which is a term borrowed from the ammunition industry. Years ago the manufacturers all agreed on a specific set of “grain weight windows” which could correlate to easy-to-understand “line weights”, as depicted in the chart to the right. As the years have passed, these original guidelines have grown blurrier and blurrier, to the point where most manufacturers today use them only as a vague starting point. Since rods and lines are still manufactured with the idea that a given line weight will function with a given rod weight, we can still match lines and rods based on their stated “weight” without worrying too much about the actual grains in the line. (In other words, when it comes to matching lines and rods, you can trust these guys: they are experts, after all). Here’s the thing: line weight has nothing to do with sink rate. I keep repeating this because it is so often confused. An 8 weight line floating line on a 5 weight rod will still float, if you can cast it. Meanwhile, an 8 weight Type V sinking line is still going to sink at the exact same rate whether you cast that line on a 5 weight or a 12 weight rod. There are situations where you might want to overline a rod, and we’ll come to that next, but understand that overlining or underlining a rod has nothing to do with how fast the line will actually sink: that is still controlled by its density. 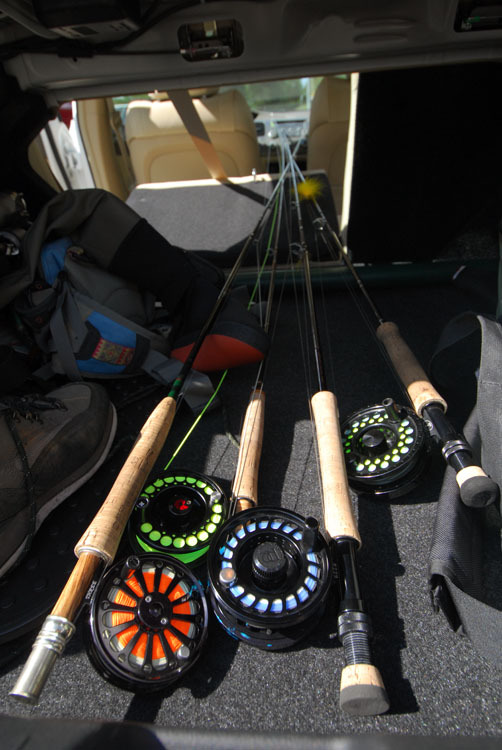 “Overlining” is a term used to describe a rod which has been matched with a fly line that weighs more than the specified grain window for that rod (or at least more than the manufacturer’s intended grain window, regardless of whether they still follow AFTMA guidelines). An overlined rod immediately changes in terms of performance; because you now have more weight pulling on the rod, it will bend deeper and achieve a greater load with less line in the air. This is the principle on which shooting heads work (and we’ll discuss those next). The typical rule of thumb when choosing a shooting head is to “overline” your rod by two line weights. For an 8 weight rod, that means you would historically choose a 10 weight shooting head, or at least a shooting head with a 10 weight’s 270-290 grains’ worth of weight. Classic shooting heads were literally just level scraps of fly line attached by various means to a thinner “shooting” or “running” line; oftentimes the running line was just a long length of plain monofilament (frequently low-memory Amnesia). In the old days, anglers, especially in the Pacific Northwest, would cut up level sections of heavy trolling line, like Cortland’s LC-13 product (originally intended for trolling, the “LC” stood for “lead core”), in order to make a sinking head. LC-13 was nice because it weighed 13 grains per foot, making it easy to construct a head which was exactly two “line weights” overlined for a given rod. If you had a 10 weight rod and wanted to make an LC-13 shooting head, you’d need a 12 weight’s worth of grains (remember, two line weights over the stated rod “weight”). 12 weights require 368-392 grains of weight according to the old AFTMA standard in the chart above, which remember measured the first 30 feet of the fly line. At thirteen grains per foot, you thus needed thirty feet of LC-13 line to make a basically perfect shooting head for a ten weight (13 X 30 = 390 grains). In the classic shooting head world, this was close to ideal, because the available product (LC-13) matched the desired head length (30 feet) for optimal casting on a 10 weight rod so closely. The trouble with classic shooting heads was that they had no taper. Zero; zilch; nada. It was thus extremely difficult to make any kind of a presentation with such a setup. The problem grew worse with lighter line weights, because you really need about 30 feet of shooting head to make it function in a loop as cast by a fly rod. A five weight LC-13 shooting head would only be about 15 feet long, which was so short the rig acted more like a medieval flail than a fishing setup. Luckily for all of us, the manufacturers perceived our need. Starting about fifteen years ago they began introducing what were originally billed as “integrated” shooting head lines; these were lines with the heavy shooting head fused to a normal fly line and with a rudimentary front and rear taper built into the head. As the years have progressed, these integrated shooting heads have evolved into full-fledged compound line tapers of their own, although they continue to share the original, extreme-weight-forward characteristics of a classic shooting head. These days there is no reason other than cost to build a shooting head yourself. Integrated lines from the manufacturers like the Rio Outbound or the Scientific Anglers Mastery Streamer Express will outperform any homebrew line, I promise. However, this brave new world has left us with some odd remnants of the old system, when anglers would cut lines in their basements based on grain weight. This is why many modern sinking lines are still sold by grain weight: the manufacturers are giving the hardliners a number they understand, even if you now need a history lesson to appreciate why this is the only area in fly fishing using such an obscure system. Indeed, the shooting head’s adoption by the broader line market had a broader effect; many anglers found that they could achieve greater distance with these lines than they could with classic “long-belly” tapers. As tapering technology grew in sophistication, the perceived demerit of a shooting head’s inability to turn a fly over in a nice presentation diminished significantly. 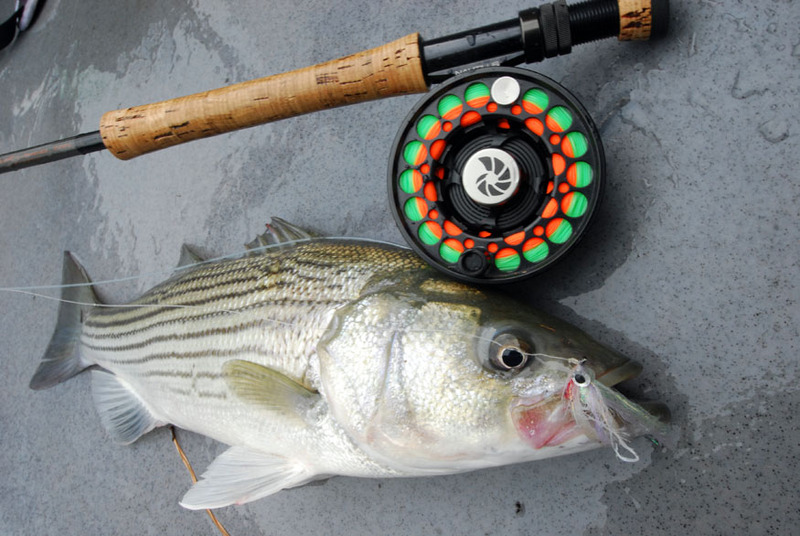 In recent years, lines manufactured for fisheries requiring both long casts AND nice presentations have increasingly gone to an integrated shooting head model (for example, Rio’s Bonefish tapers, analyzed below). Most sinking lines these days are modified versions of the integrated shooting head. This means they have extreme weight forward characteristics to help you launch long casts with a relatively short backcast. As I explained in Tips #1 and #2, though, that doesn’t mean a shooting head sinks any differently than a long belly taper. There ARE, however, ways to make sinking fly lines behave differently underwater, even those of the same sink rate. I’m speaking to the difference between a full sink and a sink tip. With a full sink line, typically the full front “head” of the line is one specific sink rate (which might also be density compensated–see last week’s Tip #4). Usually the running line (the thin part at the back) will also sink, most typically at an intermediate rate. 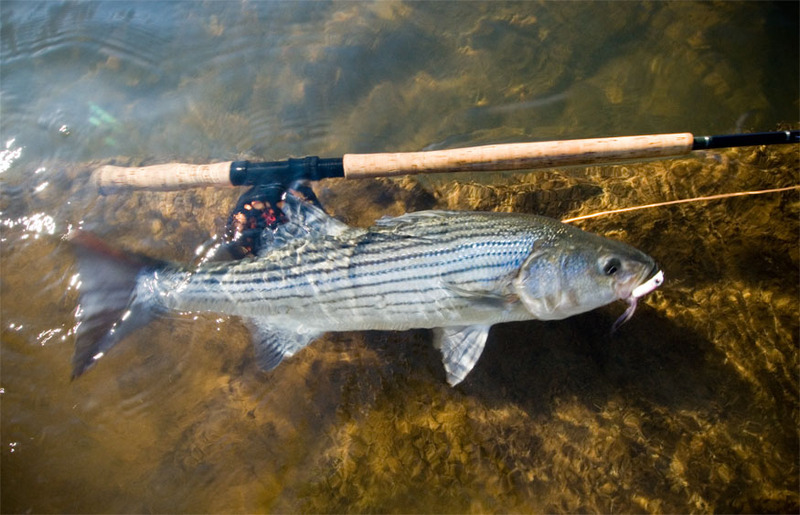 This means the head of the line will sink more quickly than the rear, but the rear is also being held up by the angler and typically is also being retrieved. A fly retrieved by an angler using a full sink line will usually track a straight line off the bank at a depth set by how long the angler can wait for it to sink and how fast a sink rate the line has, then at the end of the retrieve the fly will nose up and swim to the surface, at the angler’s rod tip. The Double Deceiver is ideal for sink-tip work. A sink tip, meanwhile, usually has a floating rear taper. 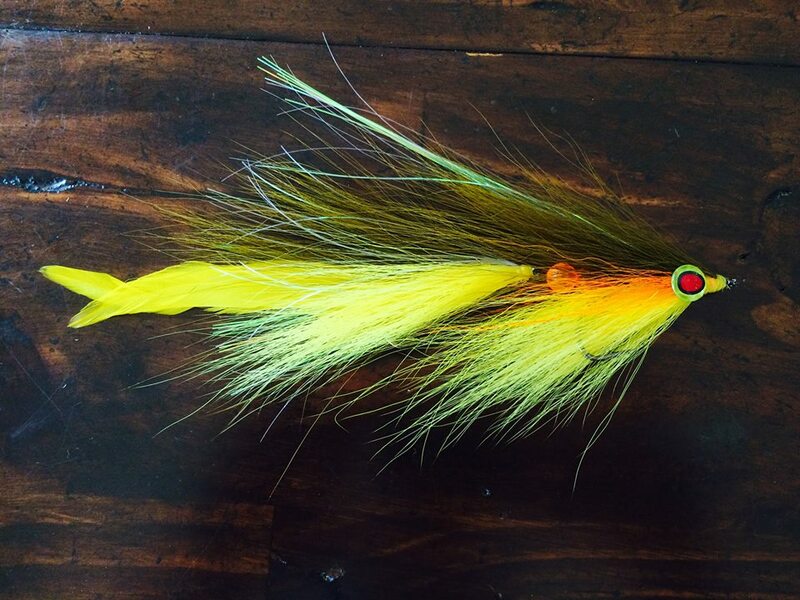 This has an interesting effect on the overall presentation, because every time the angler strips the fly, the floating section will tend to pull the sinking head upwards from the rear of the head, rather than from all the way back at the angler’s rod tip. This makes the fly track a sine-wave pattern in the water as it sinks between strips, then is pulled upwards again. All in all, this can make for a deadly presentation; especially when paired with an articulated fly like the Double Deceiver, which will exhibit a “broken back” effect between strips as it settles downwards. “Overhang” is a casting term. A lot of anglers have trouble handling overlined shooting heads (or their modern integrated shooting head equivalents), and the nature of this trouble is usually their unawareness of or inability to properly handle overhang. Overhang specifically refers to the distance between the rod tip and the back of the shooting head. In the old days, with sliced-and-diced lines and no rear tapers, this was a stark issue, because the more overhang you as a caster could handle, the longer you could delay turnover and prevent “dumping”. Shooting heads have so much mass that they can store a great deal of potential energy when they are thrown into the forward loop. When that energy encountered the “braking effect” of pulling out the running line, it was converted into kinetic energy and released suddenly, which could be enough to cause a crashing turnover of the head (i.e. “dumping”). The difference between someone who could cast a classic head 120 feet and someone who could only handle 70 or 80 had less to do with their double hauling prowess and more to do with their ability to carefully dampen their backwards and forwards motions while handling “overhang” of eight to twelve feet. That may not sound like much, but the ball and chain effect of a classic head becomes increasingly pronounced the further it gets from the rod tip. Rear tapers greatly alleviate this effect. They give the angler something to mediate the energy transition between the thin running line and the heavy shooting head, and thus they diminish the ball and chain effect. Longer front heads also alleviate this issue, which is why most integrated shooting head lines these days no longer rely on a mere thirty feet of head. In the case of Rio’s excellent Bonefish line, for example, the integrated shooting head theme has been stretched to 47 to 50 feet. 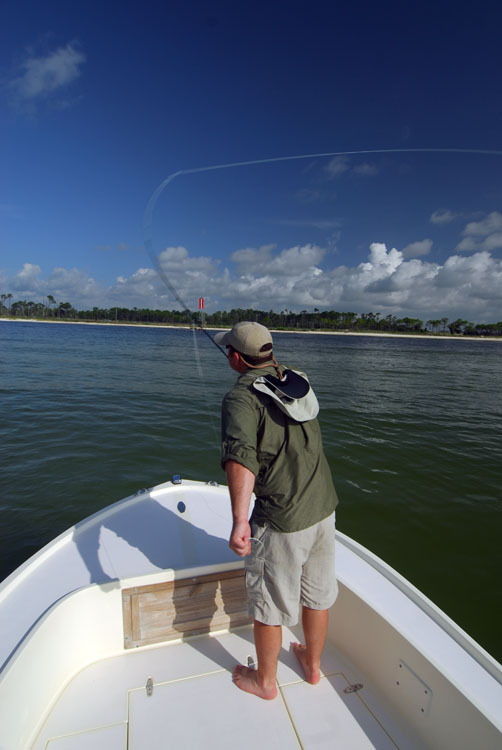 However, the classic design lives on, in the form of the Bonefish Quickshooter, which has a 35-36 foot head and thus functions much like a classic shooting head. The advantage of the shorter head is a quick loading stroke, like a catcher trying to throw out a baserunner stealing second. The disadvantage is the return of the ball and chain effect and the need to once again carefully manage overhang. We’re going to take a quick detour into the Spey world, because these lines help illustrate the principles we’ve been discussing: Skagit lines are the Spey equivalent of classic shooting heads. They have very short front heads with most of the weight in the line crammed into the front few yards. Scandi (from Scandinavian) lines are more moderate versions of this concept; they have longer front heads with their weight stretched out over a much lengthier distance. By analogy, Skagit Lines are like Rio’s Bonefish Quickshooter and Scandi lines are more like Rio’s Bonefish line. Both are extreme weight-forward designs in the sense that they have lots of thin running line behind a thick, heavy head, it’s just that the Scandi is less extreme than the Skagit. In the Spey world, there are also classic “long belly” designs, such as Rio’s Grandspey. These have “heads” extending most of the way to the back of the line, with only a comparatively short running line section at the rear end. In the hands of a master Spey caster, the Grandspey can deliver a fly well over 120 feet. In the hands of most Spey casters, however, Skagit and Scandi heads will deliver better results because they allow an angler who hasn’t quite got it all figured out to nevertheless shoot a lot of line into the cast. The extreme other end of the spectrum is the Double Taper, which still makes an appearance every now and then in classic Spey casting circles. DT lines are very nearly level; they effectively are ALL head, with only a short front and rear taper on the front and back of the line. In the hands of truly elite casters, who can elevate a whole line, these can ironically achieve some of the longest Spey casts of all, but with little to no shooting of the line. In the world of sinking fly lines, I’ve had the best results with the Skagit family, especially Scientific Anglers’ Mastery Skagit Extreme (which is unfortunately no longer manufactured). When it comes to Spey casting with sinking lines, new casters would be well advised to go with a Skagit system. The short head of a Skagit line means you’re generally able to elevate most of the sinking tip prior to launching a cast, and the heavy mass of the Skagit head helps pluck that sinking tip (as well as a wet fly) out of the water. 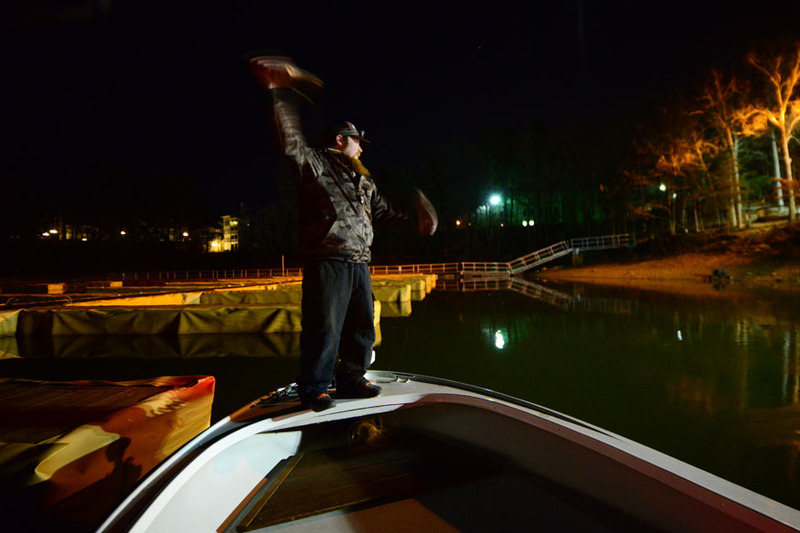 When casting sinking lines, often times the hardest part is merely getting the fly up to the surface before launching a cast. In the worst case scenario this necessitates drawing the fly all the way to the rod tip before starting over. 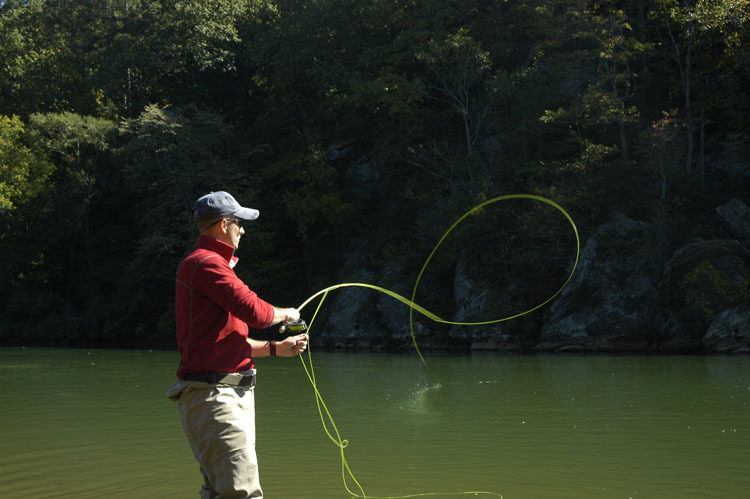 You can keep your fly wet longer by roll-casting a short-ish length of line (say 30 feet) repeatedly until you’ve elevated your sinking tip or full-sink line out of the water column. If you time it right, you can roll cast the fly into the air then immediately move into your backcast and send the fly sailing. Most sinking line fishing involves distance casting. Most distance casting involves tangles. One of the best tricks I know is to splash a little line on your boat deck or in your stripping basket in order to keep the running line from binding to itself; this water acts as a simple lubricant and can cut your tangling time in half. In my drift boat, I keep wet towels handy, and will line the bottom of an angler’s line tray with them before we go out. Water is your friend. 3 Responses to "Ten Tips to Better Understand Sinking Lines"